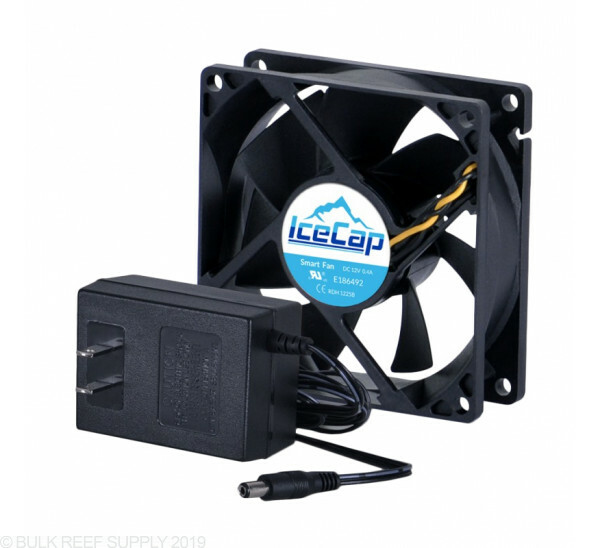 IceCap Smart Fans will automatically increase or decrease the fans speeds depending on the ambient temperature of the surrounding area of the thermostat. Makes an excellent choice for aquarium canopies enclosed stands & equipment cabinets to help regulate the temperature within. Evaporative cooling is a very effective way to keep your tanks temperature in check. By placing fans around the tank, hood, or in the stand, they can help remove warm air that may be increasing the temperature of your tank. If during the day you notice your tanks temperature slowly climb, an IceCap Smart Fan is most likely for you. I installed this fan in my stand to vent the sump underneath about two years ago. I think it's important to say that I use it to pull air into the cabinet so that the air that goes thru the fan is from the room before it flows over the salt water. I haven't found another fan that is any quieter although I wish I could. I purchased this fan to replace a fan in an odyssey fixture. It mounted early in the spot of the old one. It was so quiet I didn't think it was working, but sure enough it works like a champ. i had a custom build fan tray by Melve's Reef and the fan died in a 1 week on me. When it was working it dropped my temp about a degree or two but I was going get two of them blowing over my sump. I think that these are more for taking HOT air out of your tank stand then lowering your temp on a tank. I will return this and get a new one and see how that goes but I think this time i am going to custom cut so the fan will fit on my Apex Control panel that in my Nano stand and hopefully it will give some sort of ventilation where all of my EB8's are and all of my plugs for my apex. Okay so after my earlier review I bought a new fan and this one seems to be holding strong now for about a month...no problems...maybe I just got a bad one earlier who knows. I think its really important to try and keep these things as dry as possible. Dont be afraid to widen the holes to use zip ties on them either. Ahhhh these fans...well there okay. I have had mine installed with sip ties inside my canopy...they never got wet or anything during install and after about 3 weeks the right one is making that "bearings going bad inside the fan sound" You all know what I'm talking about...its really loud at this point with the canopy doors shut and I'm sure is on its way to dying. Fan worked for about 9 months then coordoded where one of the wires connects and no longer works. Not for use in salt water environment. Kevin's comments are spot on. Not sure why it doesn't have an "off threshold". I will look into connecting it to my Reef Keeper also. On a side note, really Rognin? You give it one star rating just because it's imperial dimensions? Reviews are based on the product's performance, reliability, and value. Go online and use one of the hundreds of free converters to see if it's the correct size for your use. If I used that criteria when purchasing a new car I would hard pressed to find one. I got this fan to cool down my tank and not use the chiller as often. Seems to work, barely use the chiller in sunny Southern California. It brought my tank 155g down about 1.5 degrees. My only complaint and the 4 stars is it doesn't ever turn off. It's not a problem as I hook it up to my Reef Keeper, but I'm not sure it needs to be on all the time. Also comes with no screws or mounting instructions so know what you're doing before you buy. All computer fans working on DC voltage are listed in MM. Why are these in Imperial... will not buy. Was curious if anyone knew the diameter of the holes of the mount area where the hardware goes thru? Can you set the temperature at which you want the fan to turn on? You cannot adjust the temp at which you want it to turn on. It will turn on when the room is in the mid 70's and the fan will speed up as the temperature rises.